Barnaby Hone on section 10a of the Serious Crime Act 2015 – a useful tool for Local Authorities to ensure effective enforcement. The following article is one of a series by Barnaby Hone exploring the issues surrounding POCA confiscation, enforcement and related topics. 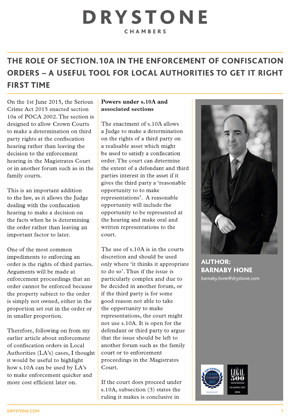 Following his initial article on Confiscation Orders, this article explores the challenges facing prosecuting authorities in enforcing the order and provides handy hints on how best to do this considering the impact of section 10a of the Serious Crime Act 2015 and how the implications of that act might best be utilised by the prosecuting authority. Barnaby Hone is currently in Poland as part of a Bar Council delegation. He has been asked to speak to delegates on international asset recovery, due to his expertise in the area. Barnaby specialises in POCA work, financial crime and regulatory matters. He is the lead contributor to the chapters on terrorism Finance and International Asset recovery in the next edition of Millington and Sutherland William on proceeds of crime. His International practice involves all forms of asset recovery.